Also in 1983 he went to further his training at the Hombu in Japan for six weeks. After training in Japan he decided to pass his Nidan which he did in 1984. Then in 1985 he fought again in the Full Contact Canadian Championship in Montreal taking 3rd place. In 1988 he passed his Sandan grading and fought again in the Canadian Knockdown Championship organised by Shihan André Gilbert. 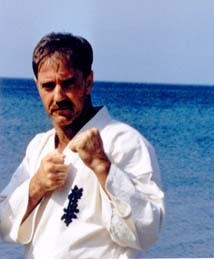 In March 1996 he was awarded his Branch Chief Certificate for the Maritimes in Canada from Shihan Yukio Nishida. He also is the current Vice Chairman of the North American Kyokushinkai Organisation under the direction of the Kyokushinkai-Kan in Japan, and has since also been awarded his 5th dan. In the Maritimes he is currently responsible for 5 schools and has many yudansha under his direction, including 1 Sandan, 6 Nidans, and 10 Shodans.